While summer is high season in Grand Lake, for us it’s a year-round destination. In the winter there is snowmobiling, snowshoeing, ice fishing or just sitting in front of a fireplace with a good book. 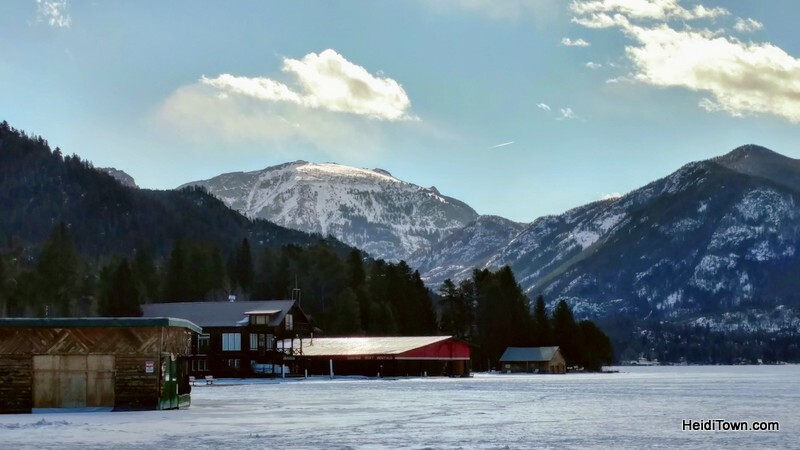 In the summer, it’s a playground of lake activities, plus everything Rocky Mountain National Park offers. Mt. 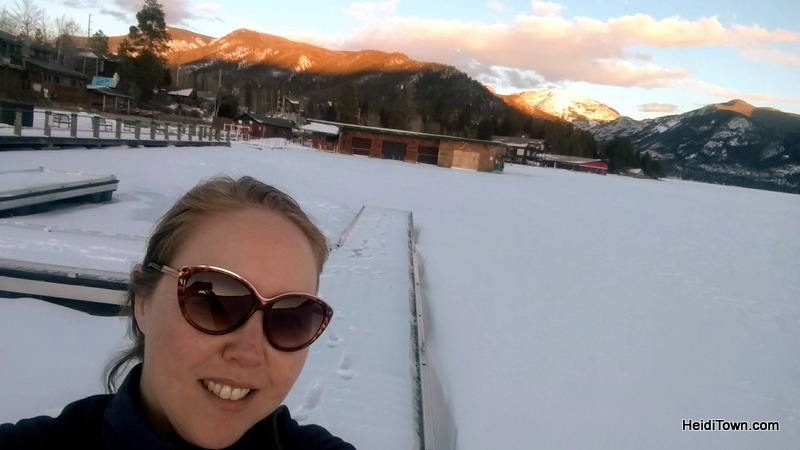 Baldy has long guarded Grand Lake, the largest & deepest natural lake in Colorado. 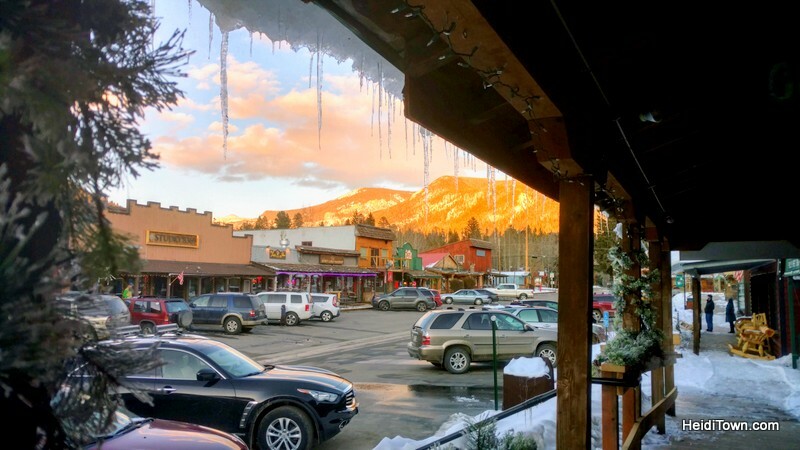 This lake town, located in Grand County, is about two hours west of Denver, and when Trail Ridge Road is open during the summer, it’s just a quick road trip through Rocky Mountain National Park from Northern Colorado. 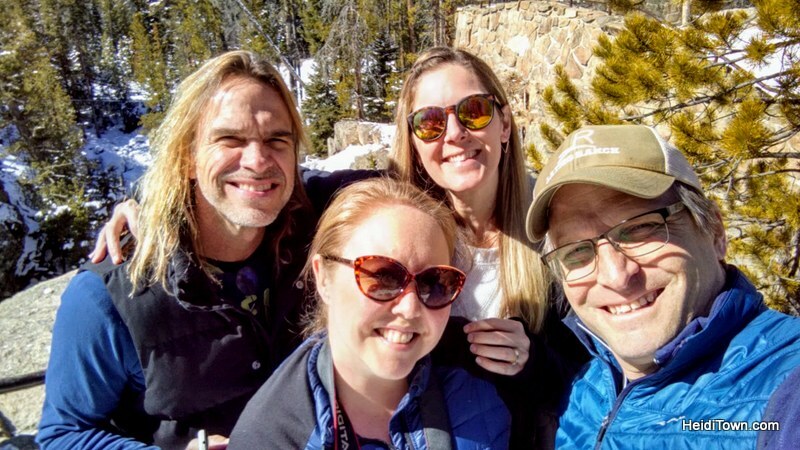 Hiking Adams Fall trail with good friends. I’ve had a long relationship with Western Riviera Lakeside Lodging & Events, a Grand Lake company with a variety of vacation rentals, from lakeside cabins to homes. This March, they invited us to stay at their newest property, the Penthouse at 1000 Grand. We brought along our friends, Karen and Steve, for a St. Patrick’s Day getaway. Penthouse at 1000 Grand Avenue in Grand Lake, Colorado. 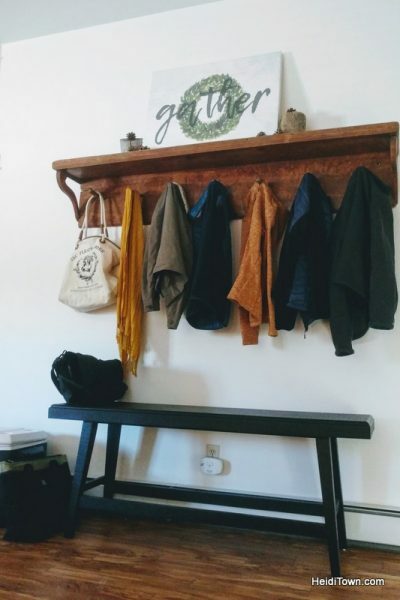 It didn’t take us long to move in. 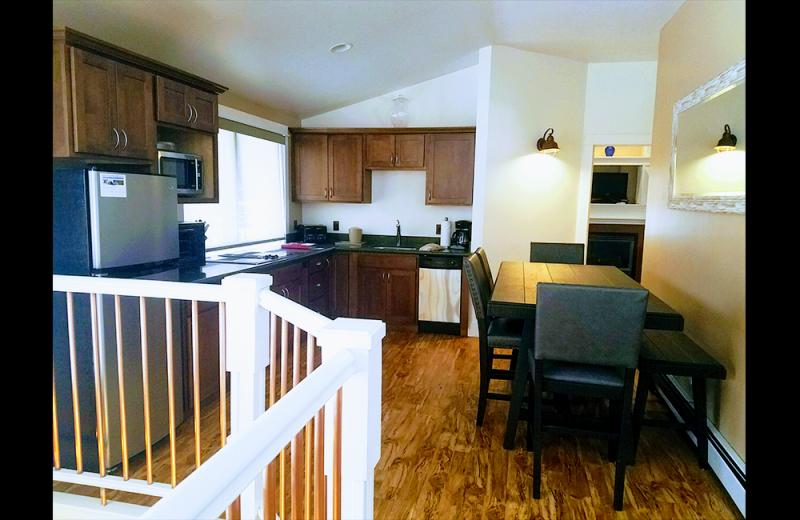 The Penthouse is as centrally located in Grand Lake, smack dab in the middle of everything, which is true of all of Western Riviera’s properties. We arrived on a Friday afternoon and checked into our three-bedroom Penthouse. On the third floor of 1000 Grand Avenue, stairs lead up to large kitchen area with wood floors and a big table for gathering with your friends. Kitchen and dining area of the Penthouse at 1000 Grand. Photo provided by Western Riviera. This is the ideal vacation home for couples traveling together because each bedroom is a master bedroom featuring a full bath and large seating area with television. 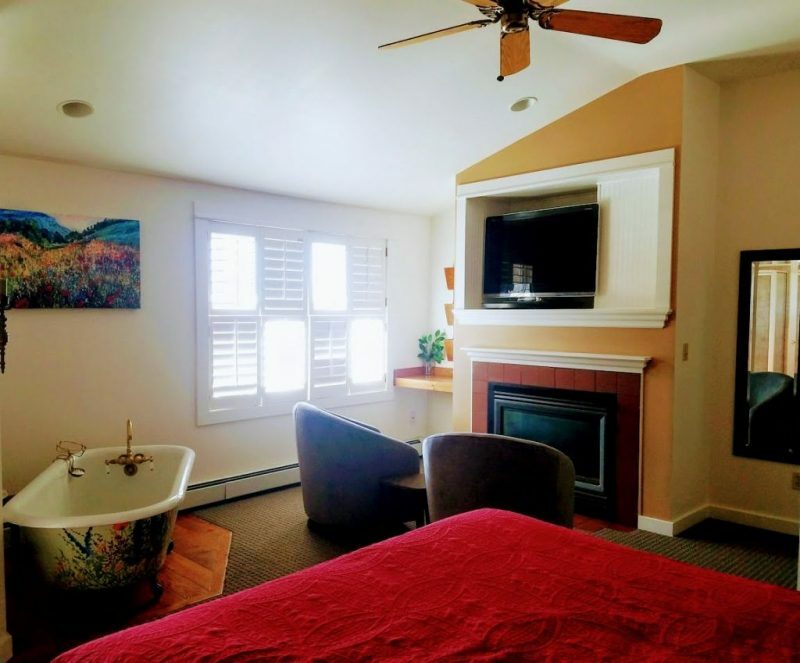 You won’t have to play Rock, Paper, Scissors to see who gets stuck in the bunk beds, although you might have to play to see who wins the room with the clawfoot tub. Bedroom #2 features a clawfoot tub. You can soak and watch the flat screen television if you wish! Photo provided by Western Riviera. That first evening, the four of us enjoyed a drink at The Lariat Saloon (in town since the 1930s) and then returned to the Penthouse to make fancy pizzas. There’s a stovetop in the kitchen, but no oven here. Thankfully, the large counter-top toaster oven cooked our pizzas perfectly. Bedroom #3 in the Penthouse. Photo by Western Riviera. 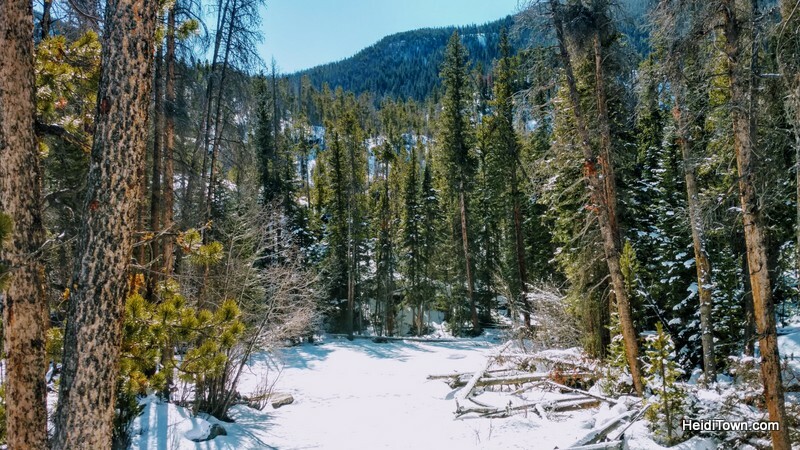 We woke up to a bluebird day and after a big homemade breakfast at the Penthouse, we drove the five-minute drive to the Adams Falls trailhead. I’ve been to Adams Falls many times, but never in the winter. On the trail at Adams Falls in Grand Lake, Colorado. A blanket of snow delightfully changes the experience as sunlight filters through the pines and makes the world sparkle. Be aware that the trail can be a bit slick and is a good candidate for those easy to slip on traction devices for your shoes or boots. 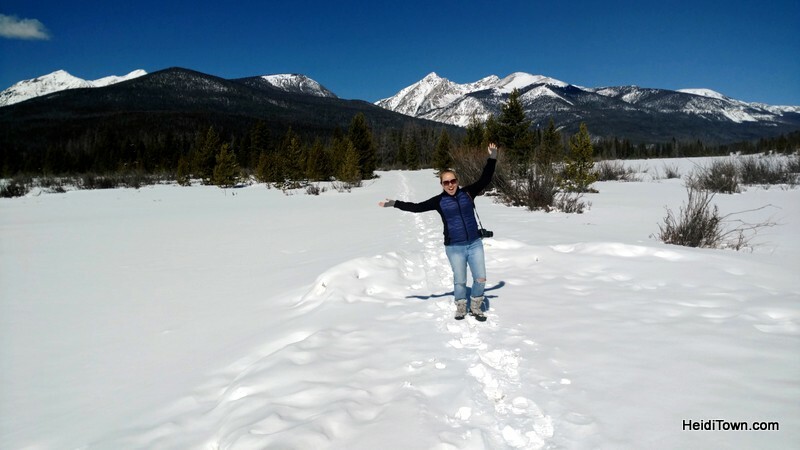 The entrance to Rocky Mountain National Park is on Grand Lake’s doorstep, so after hiking the short loop at Adams Falls, we drove into this iconic Colorado national park, stopping several times to play in the snow and admire the amazing scenery. A bluebird day at Rocky Mountain National Park is truly glorious. If you haven’t visited RMNP in the winter, it’s spectacular, especially under bright blue skies. The best part is that in the winter there are hardly any other people on the west side of the park near Grand Lake. Winter access to the park at the west entrance is approximately 11-miles into RMNP, which gives visitors access to multiple snowshoe trails. It was St. Patrick’s Day so later that afternoon we bar hopped around Grand Lake, stopping at Pancho & Lefty’s for some live Irish music and a view of the sunset, and then popping into The Lariat because that became our “local” during our stay due in part to their very nice bartender. Downtown Grand Lake on March 2018. We had dinner at Sagebrush BBQ where we caught some of the Peggy Mann Band. They were quite good and I’d say Grand County is very lucky to have them. Be sure to check the band’s schedule the next time you happen to be in the area. The Penthouse was the scene of live music too, as one of our traveling companions is an accomplished musician and brought along his guitar. We also played games and enjoyed a lot of laughter, which is good for the soul. Also good for the soul were the comfy beds and pillows at the Penthouse. As someone who travels frequently, this is always a welcome amenity. Posing with Mt. Baldy on the Grand Lake docks at sunset. 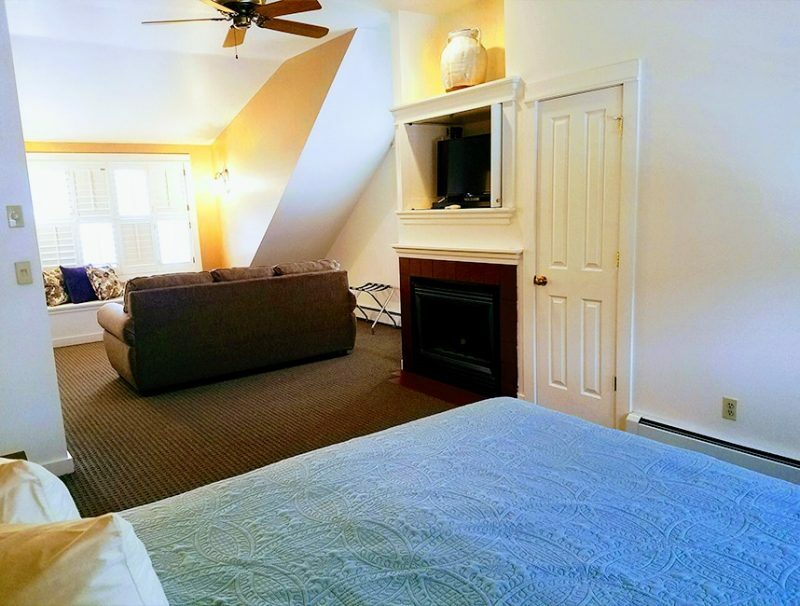 The Penthouse sleeps up to ten and is perfect for couples traveling together or a family reunion. It would also be ideal for parents of teenagers who want their own space or who bring along friends on a family vacation. Learn more about the Penthouse at 1000 Grand, and all of Western Riviera’s properties, at WesternRiv.com. Thank you to the folks at Western Riviera for inviting us to stay the weekend at their newest Grand Lake vacation property.